On Sunday, we set out to watch and photograph the shortest, and perhaps most colorful, parade we’ve ever seen. The parade, part of the seventh annual Multicultural Warsaw Street Party, kicked off Sunday afternoon at Plac Bankowy in downtown Warsaw. This event is billed as a street festival that “promotes multiculturalism through joyful fun” according to the organizer’s website, Kontynent Warszawa. I thought the parade would be fun for photos while my husband informed me that he hates parades. Guess we’ve never been to a parade in the seven years that we’ve been together. Well, I dragged him to the parade anyway with the promise of lunch and a beer afterwards. Later on, I think hubby was a little happy he tagged along as we watched the pretty gals shake their tail feathers down the parade route. 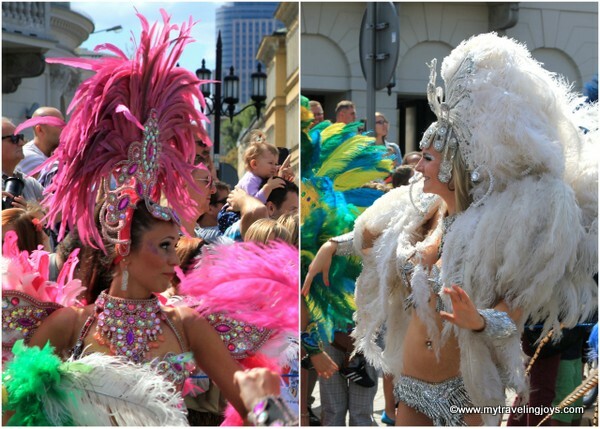 However, I suspect the majority of the women were Polish dressed up in Brazilian, African and other dance costumes. I discovered later that many of the dancers were representing local companies that offer African, flamenco, salsa, samba, tango and other dance classes. Still it was a fun parade, and I give the participants props for their contagious enthusiasm. You couldn't help but want to dance to the vibrant beats or at least stomp your foot to the rhythm. I was impressed with these local drummers, especially the gal in front. what fun! i wish i could have seen this. How can you hate a parade? husband of Joy - Bet you're glad you went now.